Flyers become living projectives, peforming leaps and flips before landing on the catchers' shoulders. Madame and the Corporation (dressed in blue) approach a seesaw-like object in the middle of the stage. 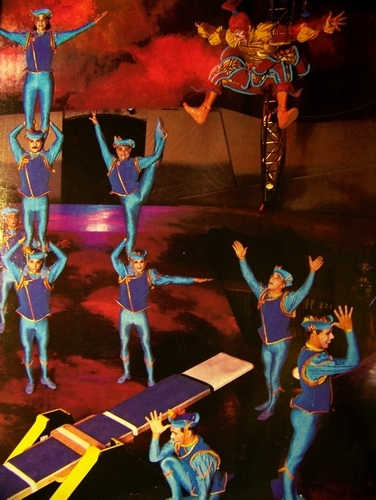 At the crack of her whip, the troupe is on the move, jumping on the end of the plank and bouncing the acrobat opposite them straight into the air. 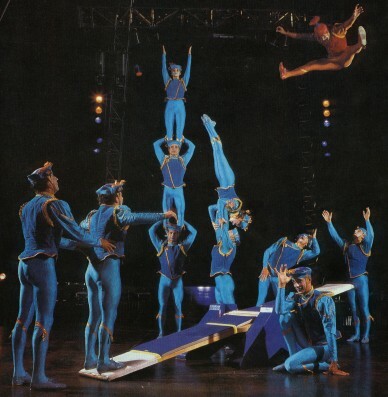 Soon they reach the right height to begin twist, spins, and even forming towers by flipping acrobats onto one another's shoulders. "Bascule" (translated: "rocker") accompanies their adventure from one plank to the next.